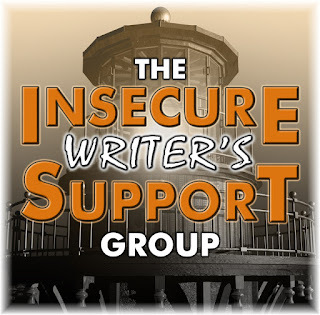 Time for another posting of the Insecure Writer's Support Group, the monthly safe haven where writers can talk about anything that is ailing them. Founded by Ninja Captain Alex J. Cavanaugh, the May posting is co-hosted by Stephen Tremp, Fundy Blue, MJ Fifield, Loni Townsend, Bish Denham, Susan Gourley and Stephanie Faris. Check 'em out! Can we be into May already? Star Wars Day too, so I'm hoping the force will be with me as I try to reboot this year. Writing has become a daily struggle over the last month or two - more so than usual. I'm not sure, but I might only have scraped out 1000 words in this time. The inspiration isn't there. Seriously, even writing this is hard. I'm not sure what's wrong with me? As you may recall, I was attacked near the start of the year, but I can't use that as an excuse for killing my confidence. A CP pointed out an issue with my book that was causing her trouble and I still can't work out if I agree. It's not like it's something that's never been covered, even within YA. I don't know if it's the approach that's the problem - I haven't brought myself to go over the offending sections yet, but as it hinges on what I'm writing now, it's kind of brought everything to a standstill. But I wouldn't lay the blame at my CP's door. I value her feedback, but sometimes I find it hard to listen to others' advice and instead forge ahead with what I think is right. The idea of rebuilding a large portion of my series is daunting, but that's my job, isn't it? This wasn't meant to be easy. So that's where I'm at. I haven't talked about this with anyone yet, but maybe now I have I can take some steps to fixing the problem. Have you ever had to drastically rethink your work? How important is your CPs' advice to you? Hope all enjoyed the A-Z Challenge who took part. I sat this one out but I'm hoping to be back in force next year! Check out the other IWSG participants here. I feel your angst. I have a manuscript that several people had problems with certain elements of the story. I froze. For a few years. Then, this January, I found a beta reader who is a retired editor and she had no problems with the story, just that there were the usual typos, grammar goofs, etc. I then sent it off to an editor, actually there are two on the team, and it came back with fixes, but no major revisions. Not to bad, eh? But I feel stuck again. I have no excuses now. Redoing a large section is scary. Look over that part and then go with your gut - big change, small change, no change. Nick, ultimately this is your book, your story. I've made the mistake of listening to others and redoing something and then, years later, regretted it. You really need to dig deep inside yourself and see if you agree with the CP or not. If it's resistance to the hard work of re-writing, then acknowledge that then hunker down and do it. If it's that you don't agree, then acknowledge that and write what you want to write. This writing business is so so hard. No one who hasn't done it can possibly understand. Good luck, dear man. Rethink my work? Only on EVERY FLIPPIN BOOK! LOL. I love the feedback CP's give, but I have to hear it from at least 2 or 3 people before I'm willing to make a major change. CP's are awesome, but their suggestions are only that--suggestions. They're not a publisher. They're not an editor. If you like the story the way it is, get another opinion, eh? I recently rewrote the first book in my WIP series, and took my CP's suggestion on an offending topic she didn't like that I ended up removing, because I actually saw what she did. Now I have to alter the other books, especially book two. So I know what you're going through. Listen to your gut or get someone else to offer their opinion. See I think you still are affected by the attack you endured a few months back. Maybe not use it as an excuse, but it certainly was life altering and changing and I think it will take a period of time until you recover from it emotionally as well as physically and of course mentally. I read all the other people's comments about what to do about your work in progress that your CP wanted to change. I'm not sure what CP is as related to writing, but I think a lot of people above me gave you great advice to consider. I know whatever you'll decide to do will be the best for you! Hang in there! And yes it is amazing that it is May. I totally forgot Star Wars Day; took a moment to get it but now it makes sense why there was a picture on my Facebook feed of 3 corgis holding light sabers and saying May the Force Be with You. Hi Nick, redoing a large portion of your manuscript isn't easy. You will need to think a lot, especially if you are not in agreement with your CP's views. Final drafts of my stories often bare little resemblance to the originals. During draft, I try to avoid going back, because I know I will find whole chunks of just utter, plotless, nonsense. No matter had messed up the story, revision is always a blessing. I always find solutions, even for the sections that I dread going back over. Just remember, even if you have to kill your darlings, don't kill the reason you love the story. Good luck! You can do it! I've had CPs give advice that I didn't agree with, but their suggestion did make me rethink and rewrite the section in question. What they are telling us is subjective (like everything else with books) and isn't set in stone. Open up your WIP and look at the part in question, consider your CPs advice then ask your gut what it says. Maybe once you dive back into it, your CP's suggestion will spur an even better idea in your head. That's exactly what I'm doing at the moment with my chapters 18, 19, & 20. That I haven't touched in over a month. Oy! I'll get back to it eventually. Man, does this sound familiar. I write noir mystery novels, so my work is unabashedly adult. Still, I rework those elements all the time. If I'm working on a project with a tight deadline I'll feel stuck if a previous MSS has discrepancies I can't ignore. Sometimes writing isn't fun, but we have to keep doing it. Sounds like your issues with your CP will take some time to figure out. Good luck, and thanks for sharing! Is this issue a deal-breaker? Or perhaps a wrinkle smoothed by the structure of a single sentence? Are your instincts leading the hesitation, or is it your heartstrings? Asking yourself these things may not be a great deal of help, but it will loosen the tension enough to remember that it's your story, your decision. I find if I have a major question on my work, it freezes everything for me. I just can't proceed until I work it out. Right now, I'm paralyzed while I try to figure out whether to leave a story a novella or try a whole second POV to make it a novel. I hope you get everything figured out. Maybe make a decision and go with it, and then if it's not working, you'll have an answer? People have given me feedback that I don't agree with. I tend to divide feedback into two categories- feedback that came with good intentions but isn't necessarily applicable to my work or feedback that is useful. Maybe you can ask another CP what they think, if you're not sure about what this CP is saying. Hi Nick - gosh I'd forgotten about the attack .. so frightening and upsetting for you and the family - I do hope the healing continues on. As for the change of line in your book - I feel sure the bloggers above will have given you some excellent advice or ideas ... a hurdle that needs to be overcome: which I hope you can jump, or get round somehow. The big thing here seems to be to determine if you agree with your CP about the issue. As long as you're on the fence, you'll probably stay stuck, but I'm guessing once you make a decision either way, things will flow much better. Have you had any other readers comment on the same thing? Hang in there and good luck! did anyone else bring up the same issue? my rule is to ignore unless at least two people bring it up; if you haven't already I recommend you seek a second opinion, before you do major changes and it turns out to be bad advice ... best of luck !! Reworking a huge chunk sounds miserable. Ya, you have to agree with it, but since it is a huge chunk you might consider getting feedback from others. I had to re-draft my first novel from scratch - twice, and then I still cut out about half the chapters and re-wrote them . . . so it had 7 content drafts by the time I finished. I get how painful it is, but if it makes the book stronger, it's worth it! Sorry you are having a hard time getting into your writing. Maybe reading more and just relaxing will help inspire you. Yes, my first and only completed novel needed so many revisions I couldn't count them. Step back, trust your own instincts, and you'll figure out what to do. Have you consulted other CPs who have read the same project? That's what my CPs do when there's one major comment that sows plot or character doubt. It often helps to work through this sort of issue to discuss it with others who have read the same piece. Hope things get back on track for you soon! I always get feedback from several people. Many times they agree on the same things. With the rest, I pick and choose what I want to follow based on my vision of the manuscript. I've had to rework major pieces of my writing before. It's not fun, but it turned out better in the end. As far as whether or not I follow advice... it really depends on who gives it. If it's an emotional problem with my story, one person's opinion weighs more than another. If it's logic, I'll lean more on a different CP. If it's a matter of tension, I'll look to someone else. It really depends on what's wrong and my own opinion of the person's writing as to whether or not I take action. Best of luck figuring out your issue! I do put a lot of confidence in my CP's suggestions. I've changed the POV of a whole novel and rewritten great chunks, and it's never easy. Good luck figuring out your problem! Sorry writing's been such a struggle for you lately! I've had to drastically rethink several of my projects in the past, and am even in the middle of doing so for another right now. So daunting, for sure. Not surprised this has ended up stalling your creativity. Best of luck figuring out what to do and finding the inspiration to write again! The advice a CP gives is always good in the fact that it makes us rethink something, but it doesn't mean it is always the right advice. Only you can decide that, unfortunately. Maybe consider tackling the revision in chunks or even writing something new while your brain figures out whether you should revise or not. Good luck! CPs are super important to me. I have to say, though, that if you're feeling like you're slogging for months already, maybe you should take a two or three-week writing-free break to refill your creative well. When I feel like the words have to be dragged out of me, it's a sign that I've burned out. Wow, lots of work. But if you agree - with some or all - perhaps it is a good thing to think about. Let it marinate in your mind, take a look, write down some ideas. I'm sure by now you've worked it all out what to do. Thanks for stopping by my blog today. Good to hear from you again. Even though we might not like what critique partners have to say, their advice might really be what our manuscript needs to become a masterpiece.